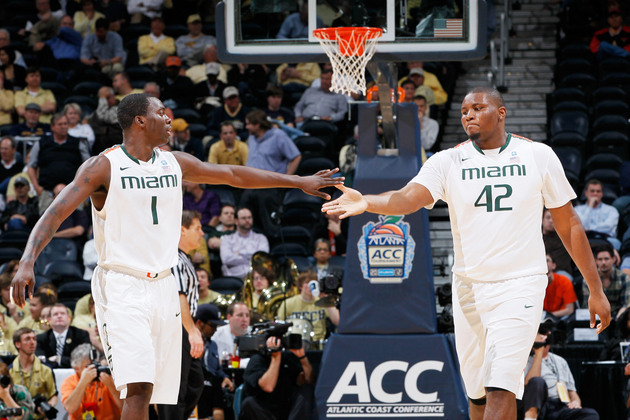 Is Miami’s exhibition loss to Division II St. Leo an aberration or an omen? It's an early November ritual as time-honored as leaves changing color and clocks moving back an hour. When a major-conference program with high expectations drops an exhibition game to a little-known lower-division program, its fan base inevitably panics and wonders whether the team has been overhyped. Miami is this year's most notable victim after falling to Division II St. Leo 69-67 Friday night in a exhibition stunner. The Hurricanes are expected to finish in the upper half of the ACC and contend for an NCAA tournament bid in Jim Larranaga's second season, but they fell behind St. Leo by 13 points midway through the second half and couldn't quite climb all the way back from that deficit. The primary question now facing Miami is whether this performance is the start of a trend or just a mere aberration. Larranaga noted that the Hurricanes were lethargic in practice last week and expressed hope this would be the wake-up call they needed, but history suggests an exhibition loss sometimes can be a bad omen. What happened next: This was the ultimate fluke loss. Led by Wesley Johnson, Andy Rautins and Rick Jackson, the Orange won their first 13 games, 24 of their first 25 and rolled to the Big East title. Only an ill-timed injury to center Arinze Onuaku and an upset-minded Butler team prevented Syracuse from making it past the Sweet 16. What happened next: A Tennessee team coming off an Elite Eight season and ranked in the preseason top 20 staggered its way through a tumultuous season. The Vols sustained upset losses to Oakland, Charlotte and Charleston in the preseason, finished .500 in SEC play, snuck into the NCAA tournament as a No. 9 seed and got hammered 75-45 by Michigan in the final game of Bruce Pearl's tenure as coach. What happened next: It took some time for Xavier to figure out how to play without Jordan Crawford, but by mid-December, the Musketeers were playing like a Top 25-caliber team. Led by Tu Holloway and Mark Lyons, they overcame some early losses, stormed to a 15-1 record in the Atlantic 10 and earned a No. 6 seed in the NCAA tournament. What happened next: The day after his team's stunning loss, Arizona coach Sean Miller learned his team had been projected third in the league's preseason poll and proclaimed, "There's no way in the world we're the third best team in the Pac-12." Turns out he was only sort of right. Arizona finished fourth in the worst Pac-12 in recent memory but the Wildcats missed the NCAA tournament and didn't live up to their preseason hype because they lacked size down low and Josiah Turner wasn't as good as expected.